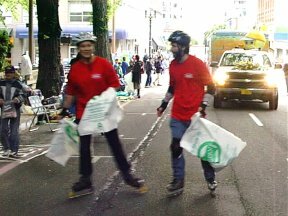 Portland Skaters skate back to the Coliseum along the parade route after handing out SOLV bags. our annual tradition. 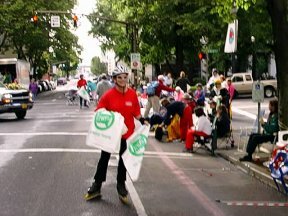 The streets were mostly dry by the time we skated back along the parade route to the starting point after handing out the SOLV garbage bags. 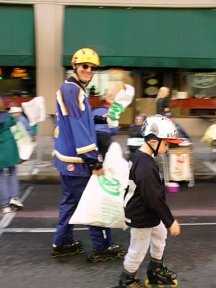 We were well received by the public and I heard many comments about what a great idea it was for us volunteers to be on skates, and how they (parade watchers) wished they had thought of bringing their skates. 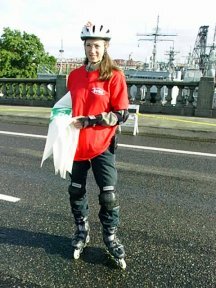 What a great way to promote our activity and gain positive publicity! 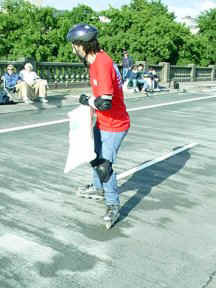 Maria on the Burnside bridge. Noah told his whole hockey team what he did, and now they all want to do it next year. Any interest in adding 12 kids to the mix? We'll definitely be back for next year! 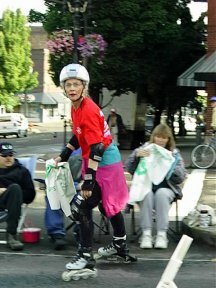 The skaters were fabulous, and the parade watchers were wonderful. 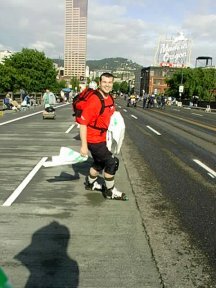 So many people on the street said they would have skated if they had known they could. 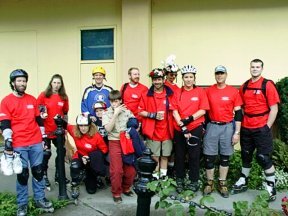 Thanks for organizing this Nancy: it was a pleasure meeting you and the great Portland Skaters. We'll try to do more inlining this summer with you. 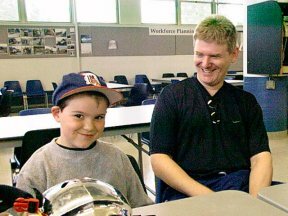 (right to left) Noah and Daniel Baxter, preparing for the early morning skate. 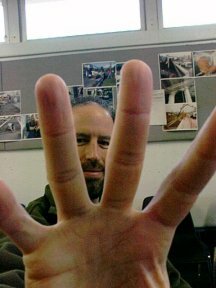 The more people get out of their car's and into the streets, the more friendly this world will be. It was very enjoyable to talk with all kinds of people out there, the police smiled too! I had a great time and was exhausted at the end of the day. Great job Nancy for your organization efforts! Charley 'stylin' down the parade route, Jerry follows close behind. 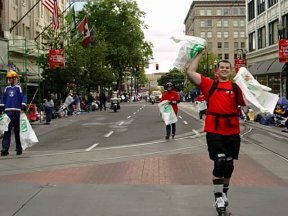 "Skating the parade route was great fun and highly recommended. Not only do you dispense with your social obligations for a short while but you get to see some really interesting people. 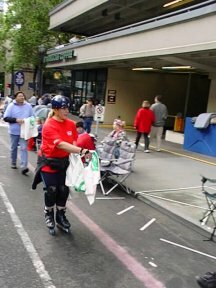 It is also a great forum for promoting skating as it appears that the public was highly intrigued." 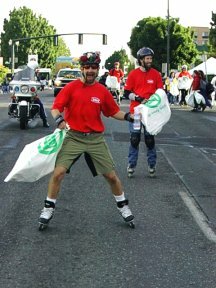 "The positive response from the public to receiving the garbage bags was heart warming. 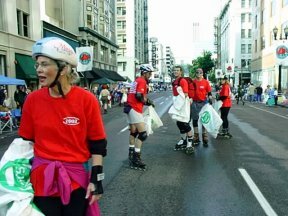 People were eager to use them and intrigued by the sight of a group of friendly faces on skates helping out for the environment. 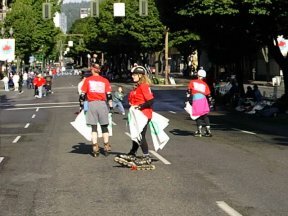 I particularly enjoyed skating back along the parade route to the starting point. The streets became a moving obstacle course of happy children, street vendors, and artists drawing with chalk on the pavement. 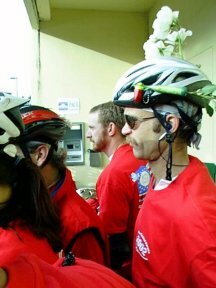 Volunteering for this event was really worth it." I am proud to live in The City of Roses. 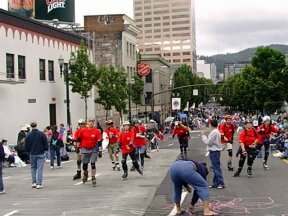 I feel fortunate to have been able to skate through the streets of Portland and feel the enthusiasm from so many Portlanders. 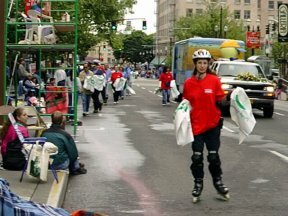 One does not realize how much organization it takes to present such a wonderful parade. 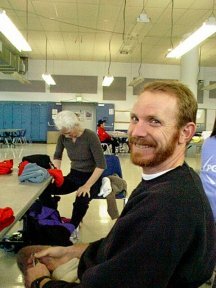 It felt good to volunteer and at the same time have fun doing it. 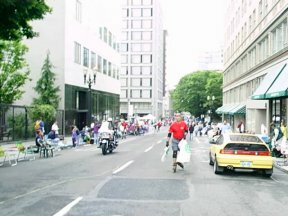 Skating back through the streets of Portland was like being part of a street fair...everyone was out having fun. I look forward to the event next year. wait for the PGE van to catch up to the them.